Beginner's Guide to Digital Painting in Photoshop is a helpful guide for digital painters tackling character art. It's a 224-page paperback artbook published by 3Dtotal so the presentation style is quite similar to their other books which are filled with screenshots and instructions. The first few chapters by Benita Winckler covers the basics of character design, more on the design aspect than on digital painting, things like what makes a character appealing or an idea work. It deals with colours, anatomy and postures, compositions and other portrait drawing related topics. The next few chapters on Bram "Boco" Sels goes into the digital painting of a character and builds on the art fundamentals covers in the first few chapters. Bram's use of colours and understanding of tone looks amazing. The other chapters feature several artists which each going through their digital painting process of a character from start to finish. So you get to see more variety of characters which includes sci-fi, fantasy and the traditional portraits. Then it's followed by a Quick Tips section with many little mini tutorials that focus on certain features of the characters, e.g. different types of hair, skin, eyes, nose, mouth, clothing material. The last two chapters are the artists gallery and a glossary of terms for beginners. 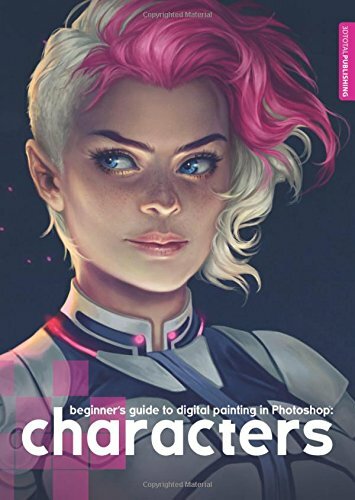 It's a helpful and insightful book for digital painting beginners. If you need something more basic on digital painting, check out Beginner's Guide to Digital Painting in Photoshop.